As we have written about recently — Change is Coming to Racist Murals in St. Paul City Hall and You Can Play a Role — controversial murals in the Ramsey Courthouse are getting a public review. 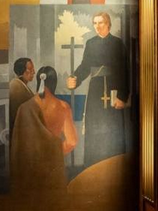 One image in Courthouse mural. 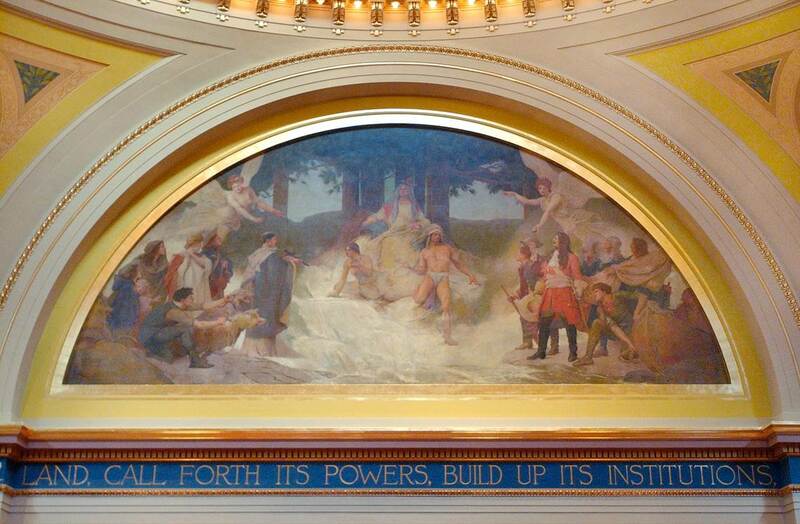 There are four large murals in the chambers shared by the St. Paul City County and Ramsey County Board of Commissioners that depict white supremacy and Manifest Destiny. They create an unwelcoming space for many citizens who come there to speak to their elected council members and county commissioners. The Ramsey County Historical Society is creating a task force of community members to select and guide local artists in creating new art that will cover two of the four murals at any one time. That means at any one time, two of the historical murals will remain on display in this public space. Advocacy still is needed to convince local leaders that all four murals should be covered then moved. If Notre Dame is going to cover all its Columbus murals, surely St. Paul can cover all of its murals. The best option would be to move them to a museum or other space where they can be interpreted appropriately. The first meeting of the task force reviewing art in the Ramsey County Courthouse is Thursday, Feb. 28 at 3 p.m. at the Courthouse. Let’s hope St. Paul does a better job than our state leaders did several years ago with their review of controversial art in the Minnesota Capitol. 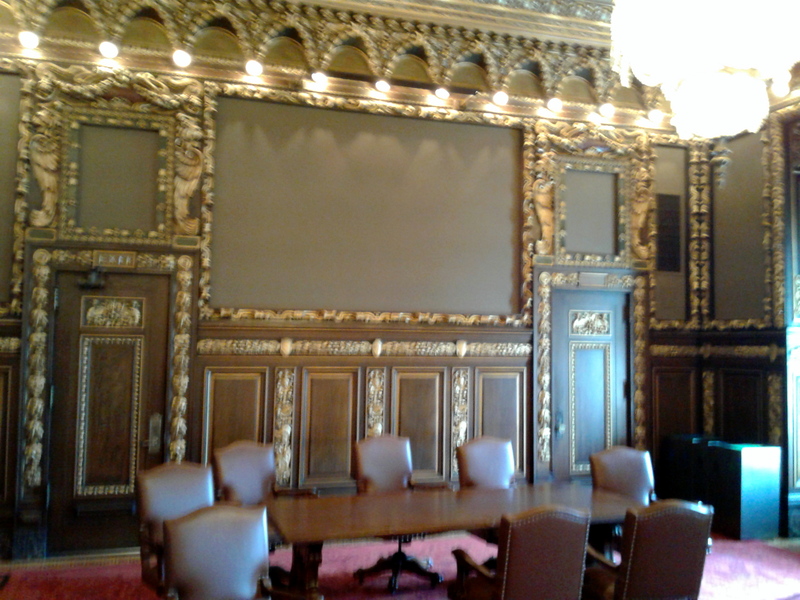 Empty space in the Governor’s Conference Room where the Father Hennepin painting once hung. To their credit, the review of Capitol resulted in the relocation of two controversial pieces in the Governor’s Conference Room — including one of Father Hennepin “discovering” the Falls at St., Anthony. Two controversial paintings were removed from the Capitol, including the “Battle of Killdeer Mountain“. It memorialized Minnesota soldiers massacring Lakota and Dakota people in the Dakota Territory. The Committee reviewing Capitol art was warned to keep its hands off the Senate’s art, including this mural. The Art Committee did not address all problematic art. It was warned it could be disbanded if it made recommendations about art in the House and Senate chambers, according to co-chair Paul Anderson. The Art Committee also didn’t review the pubic art on the Capitol Mall, which includes a statue honoring Columbus. I am so deeply grateful these horrid celebratory depictions of the genocide of our Indigenous Peoples by the church and the colonist-settlers are FINALLY being removed! and that the true history is starting to get called out for what this US nation was founded upon: land conquest, wholesale slaughter, and genocide.